Remove your Lake weeds or Pond Weeds in just Minutes with the Weed Razer. 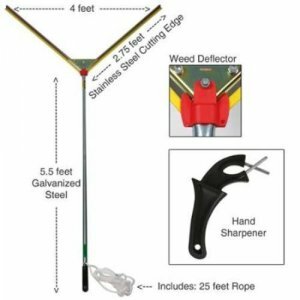 The Weed Razer is a unique V shaped lake weed cutter with razor sharp blades designed to be the most efficient and effective lake weed cutting tool made. This weed cutter will cut or shear almost any type of rooted aquatic vegetation like milfoil, lily pads, pond weed and even cattails. Razor sharp blades can shear through water and lake weeds with ease, and can also cut cattails.